Oh man… here is a tragic story. The Toronto Star reports that a young man from Toronto was back home in Newfoundland for a short break from his promising acting career, when he died from eating a plant called Monkshood. While home, Andre hooked up with friends and former classmates, taking a short boat trip on July 30 to Silver Fox Island. While they explored the foliage, it’s believed he ingested or came in contact with sap from the plant, his father said. The group left the island for the mainland mid-afternoon. Then Andre took the boat by himself to nearby Fair Island, where the family had lived in the early 1960s. There, Andre was to have dinner with his aunt at his father’s cabin. “He ate half his supper and said he didn’t feel right. He said something wasn’t right,” Bill Noble related slowly, with obvious difficulty. An ambulance was waiting on the wharf when Andre arrived after the 15-minute boat ride from Fair Island. They planned to take him to the hospital in Brookfield, about 25 kilometres away but, by 7 p.m., Andre was dead. Jack Strong, a Newfoundland horticulturist, said ingesting as little as five millilitres of monkshood sap can be deadly. “Only five millilitres, that’s a very small amount,” he said. “Cases of poisoning have been reported when the leaves were mistaken for wild parsley, or the roots were mistaken for horseradish. “And even if you’re exposed externally, on the skin, a sufficient quantity can still cause poisoning. That’s why if you do come in contact, you have to wash your hands quickly, or I’d be inclined to wear gloves. 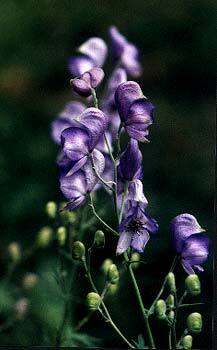 Monkshood, or Aconite, which resembles the delphinium, is actually a common plant in home perennial gardens. It is known by many common names including Wolfsbane, Leopard Bane, Tiger Bane, Dog’s Bane, Friar’s Cap, and Friar’s Cowl, Garden Wolfbane, Helmet Flower, or Soldier’s Cap. In older times, it was used to poison meat to kill wolves; it was considered a key ingredient in a potion used to make witches fly; and Claudius I was assassinated by his physician, who slipped him some. Somewhere around 1840, two Catholic priests arrived to dinner with other guests of the Provost of Dingwall. A servant obtained a radish from the garden for the guests to use as garnish on their meat, in consequence of which three at the table died, including Father Angus Mackenzie, Father James Gordon, & Father Gordon’s grand-nephew. Aconite acts on the nervous system by first stimulating and later paralysing the nerves of pain, touch and temperature. Taken internally aconite acts on the circulation, the respiration and the nervous systems. It causes severe nausia, slows the pulse, caused the heart to beat erratically, and causes a dramatic fall in blood pressure. Death is usually caused by paralysis of the respitory system.